The Paddle and Rymer Weir is located on the River Thames near Hampton Court Palace and is part of an extensive and well established weir complex which is utilised by houseboat residents. Construction of the new structure involved water based activities only and was facilitated through a 45-tonne crane barge with spud legs located upstream of the weir. 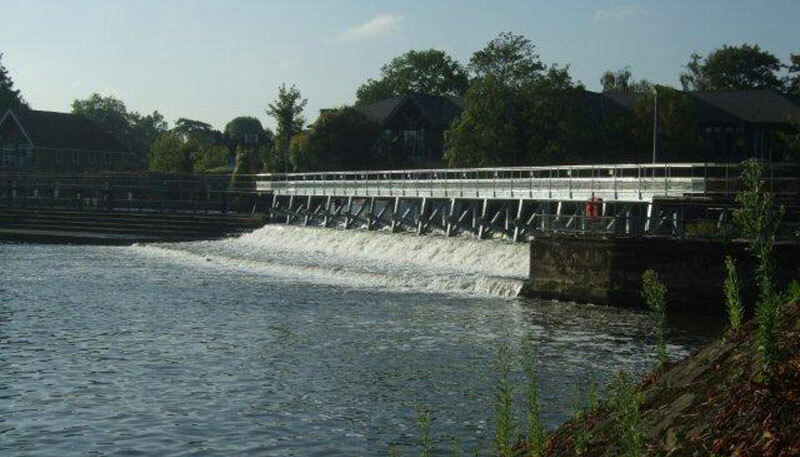 • Replacement of the Paddle and Rymer Weir with 13 new hand-wound radial gates constructed on new A-frames. • Construction of a new eel pass on the southern end of the existing fixed crest weir. • Timber handrails to replace the existing kee-klamp railing to enhance the conservation area. • A temporary scaffold walkway was installed along the full length of the structure, to provide access to the island and weirs.